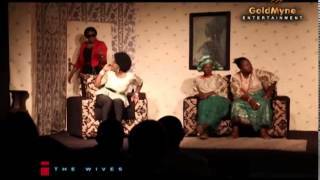 Here's a 6mins+ video from the Nigerian drama The Wives, an evergreen stage play written by Prof Ahmed Yerima - which recently opened at the Agip Recital Hall of the Muson Centre Onikan, Lagos. The star studded play features Nollywood stars Kate Henshaw, Ireti Doyle, Kemi Lala Akindoju, Joke Silva, JideKosoko, Adebola Williams and Toyin Oshinnaike. This particular episode of The Wives you are watching didn't feature Kate, Joke, or Jide Kosoko; rather it featured other casts.